The In The Spread Snook Fishing with William Toney video, http://inthespread.com/snook.html, features Capt. Toney discussing the baits and lures that work when targeting snook on Florida's gulf coast. Learn a few winning tactics you need to catch more snook. The In The Spread project is produced in association with Full Throttle Media. Visit www.inthespread.com to watch these and many more sport fishing videos to learn from some of the world's best fishermen. 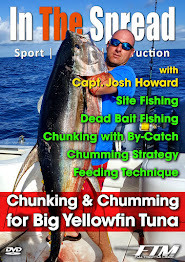 The In The Spread Yellowfin Tuna Chunking, Drifting and Live Baiting video, http://inthespread.com/tuna.html#yellowfin, features philosophies and tactics for targeting yellowfin tuna, how to catch more tuna, the baits you need, rods, reels, terminal tackle and much more. Enjoy this short trailer from the film. The In The Spread series of videos is produced in association with Full Throttle Media. Visit www.inthespread.com to watch these and many more sport fishing videos to learn from some of the world’s best fishermen. Subscribe to www.inthespread.com to watch the entire library of full length sport fishing instruction videos. The In The Spread project is produced by Seth Horne in association with Full Throttle Media. Learn how to rig dolphin belly for daytime swordfish with this In The Spread fishing video.